For information about the International State Crime Initiative, visit the website here. Abstract: Afghanistan constitutes a good example of how the absence of transitional justice measures leads human rights violators of past regimes to remain in positions of power with impunity and to continue to engage in other forms of crimes. In particular, this article focuses on land grabbing as a form of economic-state crime in the country. Relying on data gathered from fieldwork in Kabul in 2013 and 2014, we illustrate that economic crime, which is instigated, supported and carried out by the state apparatus, is a form of state crime, which criminology needs to address more seriously. Criminological literature on socio-economic rights violations as a form of economic and thus state crime is very limited, particularly in conflict and post-conflict situations. By focusing on economic-state crime in the (post-)conflict situation of Afghanistan, we aim at bridging the classical divide between transitional justice studies on one hand and criminology on the other hand. Abstract: Refugee camps are generally conceived as an indication of ongoing conflict. As refugee generating conflicts become increasingly complex and protracted, however, camps become sites of post-conflict reconstruction. This has been the experience for the Bhutanese refugees who have lived in camps for close to thirty years, and are subject to numerous efforts to reconstruct their lives, community and economy. The international organizations that fund and manage the camps have directed their attention to the society of victims, rather than the state that perpetrated the crimes. Yet because the population lacks citizenship and their camps exist within another post-conflict state, these reconstruction efforts have contributed to corruption and exploitation. This article highlights that when post-conflict reconstruction is used to transform populations rather than states, these efforts may foster corruption because they allow the original perpetrating state to act with impunity. Abstract: The 2014 Euromaidan revolution, which started as a non-violent demonstration for European integration, eventually gave rise to a nation-wide movement against the usurpation of power, corruption, and human rights violations. One of the main demands of Euromaidan protesters to the new government was to launch a comprehensive personnel reform that would cleanse the state apparatus from public officials of the Communist era (1919–1991) and those affiliated with the Yanukovych regime (2010–2014). This article examines the lustration process in post-Euromaidan Ukraine through the prism of earlier personnel reforms, mainly in Central and Eastern Europe (CEE), and discusses the similarities and differences between them. The analysis focuses on two key features that make the Ukrainian case stand out across CEE lustrations. First, Ukraine’s lustration reconciled transitional justice with socio-economic imperatives, such as the fight against corruption, not only as a discursive practice but also a legal matter. Second, unlike CEE lustrations the Ukrainian government implemented lustration 23 years after the fall of Communism and during the ongoing military confrontation in eastern Ukrainian Donetsk and Luhansk regions (Donbas). The article contributes to the literature on the evolution of transitional justice which has expanded far beyond the conventional redress for past human rights violations and may now incorporate peacebuilding and structural justice agendas. Abstract: Structural violence is a central, yet neglected, problem in post-conflict and transitional societies owing to the circumscribed sphere of action within which dominant processes generally operate. 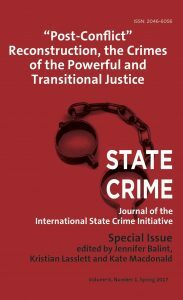 This article analyses the potential of transitional justice to reduce structural violence, finding many of its mechanisms limited in this regard. In response, I argue for the necessity of an alternative transformative justice approach that pays more attention to the historical and socioeconomic underpinnings of armed conflict, and critical analyses of the prevailing social structures and power relations on which it is founded. Conceptualizing transformative justice as the most comprehensive stop on a transitional justice continuum ensures that these issues are taken seriously without discarding the field’s existing expertise. I operationalize transformative justice by creating an innovative structural violence reduction matrix that interrogates the diagnostic, process and outcome dimensions of initiatives undertaken in transitional contexts. Abstract: This article examines factors which led to what became known as the “false positives” scandal in Colombia, in order to analyse the extent to which socio-economic inequalities and the persecution of the poor impact conflict dynamics and prospects for sustainable peace. The false positives scandal concerned the arbitrary execution of, principally, poor, marginalized male civilians by the military, sometimes in collaboration with illegal armed groups, who were then presented as guerrilla fighters having been lawfully killed in combat. These crimes were primarily committed between 2002 and 2008 and involved the execution of over 3,000 civilians. The scandal constitutes one of the most shocking global examples in recent years of crimes of the powerful: crimes committed by state actors against the most dispossessed and marginalized members of society. It will be argued that criminal accountability for those responsible for these crimes is important, but it is not sufficient. There is a need to address extreme socio-economic inequalities that prevail in Colombia and socio-cultural attitudes towards the poor which dehumanize and, thereby, deny or justify crimes and other harms against them. Otherwise the poor will remain vulnerable to further victimization and peacebuilding will not be successful or meaningful to those beyond privileged and elite groups. Abstract: This article analyses the security, governance and economic reforms carried out by Fujimori in the 1990s as strategies of pacification seeking to restore a capitalist social order disturbed by the economic and social turmoil of the 1970s and 1980s. First, I show how different forms of state violence were intrinsically connected to the pacification process. Then, I argue that the social order produced resulted from the articulation of populism and authoritarianism with neoliberalism. Subsequently, I contend that crimes, harms and violence continue within the current democratic configuration precisely because pacification is an ongoing process seeking to maintain an order which is intrinsically exploitative, creates favourable conditions for economic crimes and corruption and resorts to repressive violence when challenged. I conclude by suggesting that the social, political and economic landscapes that provided the impetus for pacification have been transformed through the new social order, further weakening already frail democratic institutions.